So this dish is a twist on shakshuka, that beautifully spiced North African dish of eggs baked in a spicy, sticky tomato-pepper sauce. It came about because I had bits of vegetables and odds & ends lying around in my fridge- and I am unapologetic about combining the most random elements to create a dish, if it suits me. So I had one carrot. One small bunch of kale. A wrinkly red red pepper. Some tomatoes. Half a dozen eggs. And an almost-empty jar of green mung dal. I decided to toss everything together, crack some eggs on top and put it all in the oven. Minimal effort, fewer dishes to wash, and an all-in-one meal. I think hotchpotch-meal creation is genetic. It comes from my maternal grandmother. Just nonchalantly tossing things together (which you normally wouldn’t,) and making a meal of it. My grandmom would put things in front of us, combinations which we weren’t used to, and if we questioned the meal, she’d just say “of course you can add ___ to sambhar!” without batting an eyelid. The ___ in question could be something like cauliflower, which really isn’t added to sambhar, but if there was an odd end of it lying around, it would go in. And for this bake, whatever little I had in my fridge was thrown in. (Ok, gently sautéed and wilted in.) I cooked the green mung dal beforehand of course, (in a pressure cooker,) because they can take a while to get tender. In a largish skillet or pot, heat the olive oil on medium-to low. Add the garlic, lightly sautee, then add the tomatoes and allow them to soften. Add the spices and sautee till the raw smell of the spices disappears- the oil will start to separate a little at this point. Add the carrots and bell pepper, season with salt and pepper. Cover and cook for 10 minutes until the mixture begins to break down and soften. Add the lentils and wilt in the kale, cover and simmer till the mixture thickens. Next, take the mixture off the heat and transfer to an oven-proof baking dish, or you could use the same skillet if it’s oven proof. Make gentle wells in the mixture with the back of a spoon and crack the eggs in. Season with salt, pepper and a drizzle of olive oil. Crumble some goat’s cheese or feta over the top, and bake at 180 C for 15 minutes or until eggs are cooked and the yolks are set to your liking. 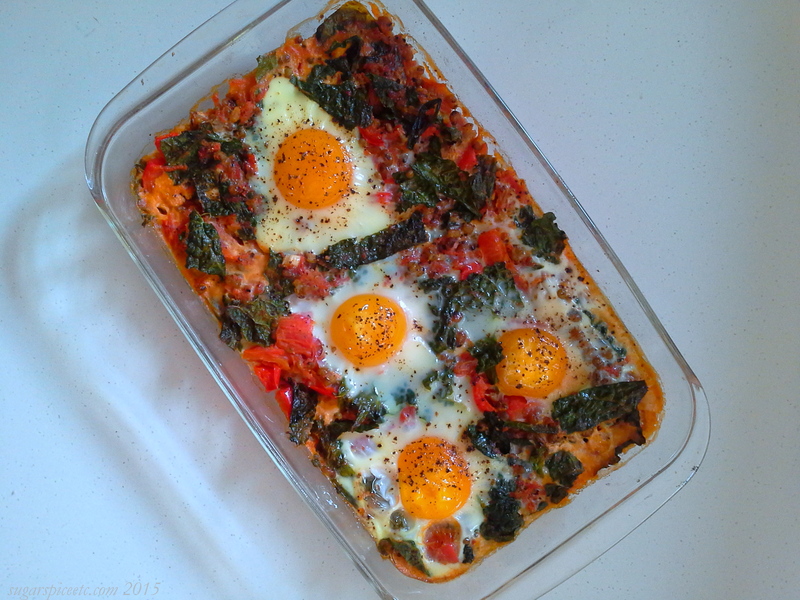 I don’t like runny yolks, so I kept my dish in the oven for a while longer.